Alright. Let's see if I can make this a habit. The next five Saturdays I will (try to) cover the Ace Attorney series in something I'd like to call Saturday Morning Objections! Why you ask? 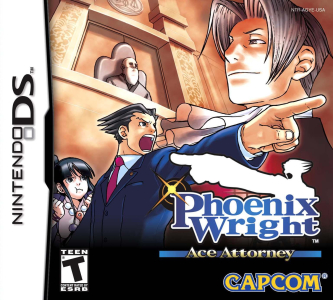 The idea just sprang into my head as I replayed the whole series from start to finish because I refused to finish Apollo Justice before the Phoenix saga. Hopefully by the fifth week, I'll complete Apollo. Now enjoy this gimmicky idea that will prove to be no different than any other writeup I've done. You begin the game as Phoenix Wright, a defense lawyer taking on his first trial. That may seem overwhelming, but the first case also acts as a tutorial for the game. With the helpful mentor, Mia Fey, at your side, the game makes sure you are comfortable with the controls. The game is a point-and-click adventure that takes place while either investigating different locations and interviewing witnesses or within the courtroom. It can be played by using the stylus or by using traditional D-Pad controls. The game also makes use of the internal microphone of the DS. Let me tell you, nothing feels as satisfying as yelling out "OBJECTION!" into the microphone during tense situations during courtroom play. And yes, I do play this game in public and I do yell out loud when I can. While going through the different locations in the game, you get to tap on and observe details presented to you. When talking to witnesses, you are given topics to select to discuss with them. You can also present evidence to witnesses to possibly provide you with even more information to be used in court. Once you have collected enough evidence and information, you are then taken to the courtroom where you engage in verbal battles. During court, Phoenix listens to testimonies of the different witnesses and it is his job to spot the lies to protect his client. This is done by pressing the witness to elaborate on their statements and by presenting evidence to disprove some claims. Of course, you can't go all tap-happy and present evidence that's not related to witness statements. Do this and the judge will lose his patience and Phoenix's "life" (represented by five exclamation points) will deplete. Losing all exclamation points will result into a game over. The controls are great and the first four cases do a good job using them. The fifth case, however, utilizes the stylus controls creatively. Being created exclusively for the DS version (the original Japanese games were for the GBA), you get to use forensic technology to help you with the case. An example of this is by dusting for fingerprints. Powder is spread onto a surface by use of the stylus and excess powder can be removed by blowing into the microphone. It's a very simple, yet neat way of adding to the control style. Now if there was one thing I would complain about the game, it would be the trial and error used at certain points. In order to progress in the game, one must present evidence. Sometimes, however, what you are presenting is wrong. And for me, at times I wasn't even CLOSE. When I would finally have the correct evidence presented, the answer seemed so obvious but only after the game explained why. Trial and error didn't hinder the experience for me though. It was just a very minor annoyance. A lot more can be said about this game (heck I quote this game so many times), but they are all things that must be experienced. When I first played this game, I was thoroughly surprised. It came out of nowhere and it delivered on many levels. The controls were very simple, but very effective and it did not lessen the overall experience. And of course, the characters (with their wild and over the top personalities) were very memorable and do not fail to make you laugh.